Coat ham steak on both sides with cooking spray; season with black pepper to taste. 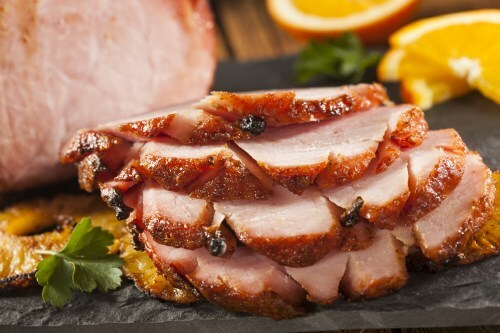 Grill ham on preheated grill until meat shows good grill marks, 4 to 5 minutes per side. Cut ham into bite-size pieces. Whisk melted coconut oil, Dijon mustard, lemon juice, champagne vinegar, and 1/4 teaspoon black pepper in a large bowl. Toss mixed greens into dressing to coat. Divide salad onto four plates and top with ham and feta cheese.